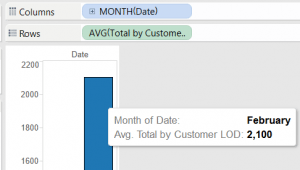 “Can you tell me the average total monthly purchase amount our customers had month over month?” This seemingly simple question has driven many a Tableau user to madness or, even worse, SQL scripting. But now, with Tableau 9.0, Analysts have access to the powerful Level of Detail (LOD) Expressions. 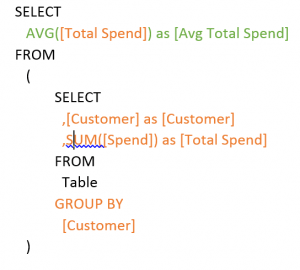 LOD expressions could be compared to SQL Windowing (or OVER) functions. They allow for us to specify an additional layer of data manipulation (i.e. a sub-query) prior to our final data calculations. 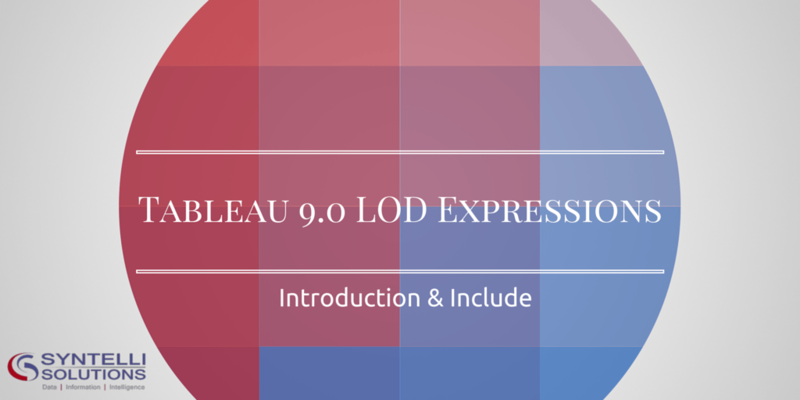 In this article we will introduce the LOD expressions, discuss some Tableau history as to why these expressions are so important, then take a deep dive into the “Include” LOD expressions. 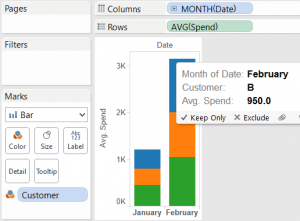 We’ll walk through a use case were we can now get the average total monthly spend of our customers, in Tableau, without any data level manipulation to our transactional data. I think this will be very informative to those ready to upgrade to Tableau 9.0, read on for more info or download the PDF file with the instructions below! 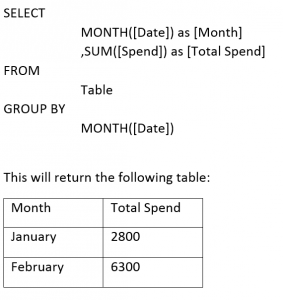 Average of total customer spend by month is a question that inevitably gets asked in almost any transaction driven industry, and it seems to confound the very foundation Tableau was built upon – which is only bring in the data which is necessary into the visualization. 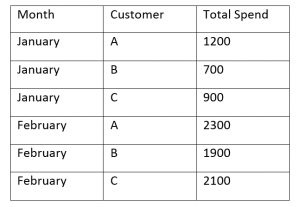 However, if I have a multiple transactions from multiple customers over multiple months, and I want to know the average of the total purchases by the customers each month, I would first need to sum the transactions by customer by month, then take the average of the amount spent each month. This means I have to use a dimension (i.e. customer) that I do not want to include in the visualization! 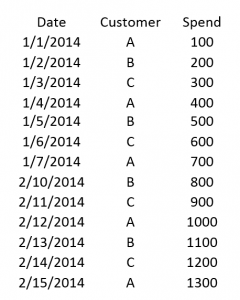 Here we have some transactions from three customers A, B, and C during the months of February and January of 2014. But there is no easy way to sum up what each customer spent that month, then take the average of the total customers’ monthly purchases. Tableau began as a tool to make visualizations on top of structured databases. And it was good. Classification and Ordinal data were assigned to “Dimensions” while numeric data were assigned to “Measures” with little loading time as these were all pulled from the schema. Loading only occurred when a user dragged these dimensions and measures to the “shelf” and Tableau would construct the database query for you and pass it to the underlying database. 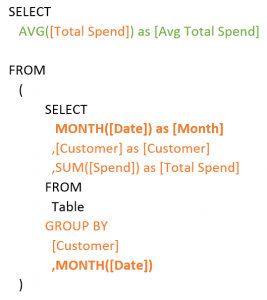 Although Tableau uses its own custom query language called VQL (Visual Query Language) I’ll give some examples with SQL based on the above visualizations. 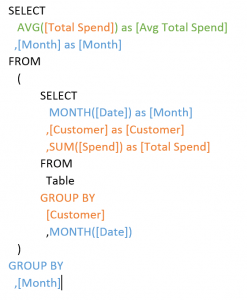 We can see the similarities between the Tableau “gems” we drag over to its shelf and the syntax in our SQL query. Our measures are aggregated (i.e. SUM([Spend])) and our dimensions are contained in the “GROUP BY” clause (i.e. GROUP BY MONTH([Date])). Tableau has created a way for us to create visuals, directly from a database, without learning any SQL! Fantastic! While this may look complicated, all we are doing is selecting from the items returned by another query, i.e. a sub query. But here lies the problem, the data must be pre-aggregated in order to calculate the average of sums. 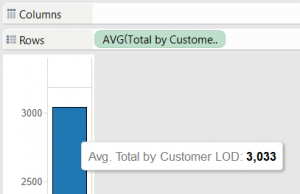 Prior to 9.0 there was no way to communicate to Tableau that the data element you are dragging onto the shelf should not be used in the visual, but used to pre-aggregate the data before your final calculations. 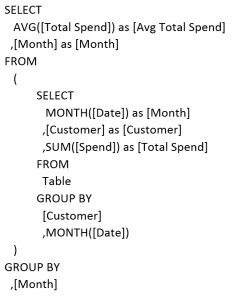 The only solution was to either use custom SQL when connecting to a data source or have a new SQL View created, where both solutions have the data pre-aggregated by month and customer. This solution is very sub-optimal. We have limited our ability to divide the data into weeks or days and we can no longer access the individual customers. But this has changed in Tableau 9.0! Green corresponds to our row expression, blue to column, and orange to the level of detail. You can see that everything in the subquery is either in the LOD expression or the column, i.e. nothing corresponding to the row expression is contained in the subquery. Our row expression is only used as a top level aggregation and the top level aggregation only contains values included on the shelf. Notice something interesting, however, about our subquery. Not only does it include the aggregation specified by our LOD expression, but it also includes any other shelf aggregation (i.e. “month”) apart from our row aggregation (i.e. average of our LOD expression). Notice that we did have to make a calculated field indicating the month of the transaction, LOD expressions will not allow other custom expressions to the left of the colon; however, they will allow calculated fields. – Exclude: The opposite of Include. 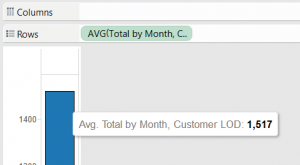 Tells Tableau not to use a value on the shelf when performing a calculation. Useful for comparing overall totals to dynamic hierarchies. 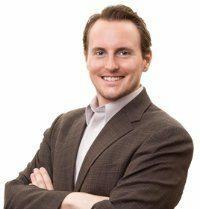 Using Business Intelligence platforms to bridge the gap between Advanced Data Analytics and the efficient effective principles of accounting, Daniel applies technology and mathematics to make business faster and smarter.